The C.A 5275 multimeter is equipped with a double 6,000-count backlit display and a 61+2-segment bargraph with remanent effect. Its 600V CAT IV safety is backed by IP54 ingress protection. Its very wide measurement ranges allow measurements up to 1,000 V, 10 A, 60 MΩ and 60 mF with resolutions of 10 μV, 1 μA, 100 mΩ and 1 pF. 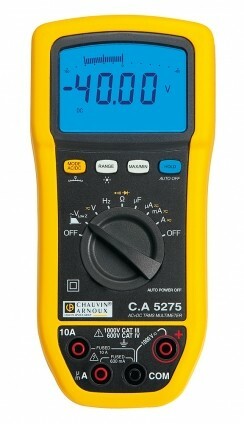 Designed and manufactured in France by CHAUVIN ARNOUX, this multimeter comes with a 3-year warranty.